This entry was posted on December 12, 2016 by admin. Monsanto (now merged with Bayer) is a the largest agricultural biotechnology company in the world. They are also the planet's leading producer of genetically modified organisms, or GMOs, a process that promotes the manipulation of traits which naturally occur in plants and crops. Ever since the company gained government approval for their first modified soybean in the late 1990s, a public debate has persisted as to the potential health hazards of GMO products. 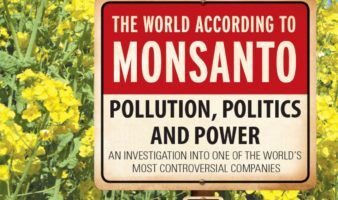 The feature-length documentary The World According to Monsanto provides a comprehensive overview of that debate. As detailed in the film, Monsanto has long been steeped in controversy. During its earliest incarnation at the start of the twentieth century, the company manufactured a series of products which were eventually deemed unacceptably toxic in their applications, including the DDT insecticide, Agent Orange and polychlorinated biphenyl (PCB). Monsanto produced the latter in the town of Anniston, Alabama for nearly four decades. When Anniston residents began to link the chemical to increased incidents of cancer, retardation and a variety of other chronic illnesses and abnormalities, they successfully sued the company to the tune of 700 million dollars. The film spends much effort in exploring the dangers of Monsanto's most profitable product - Roundup, a herbicide that has proven enormously popular in both homes and agricultural communities for its ability to kill weeds. The filmmakers discover that the company was reprimanded twice for false advertising in claiming the product was biodegradable and friendly to the environment. Many concerns persist regarding its potential long-term effects on the environment and human health as proper testing has never been officially sanctioned. The film places the blame for this squarely at the feet of the United States government and its most influential policy makers. Monsanto wields great influence in Washington, DC, and the filmmakers accuse those in power of being susceptible to the company's strong-arm bribery tactics. The World According to Monsanto ultimately suffers from its central framing device, which consists of filmmaker Marie-Monique Robin sifting through Google search pages to find the next lead in her investigation, as well as its one-sided view of the issue. But the evidence it does offer provides much food for thought. German pharmaceutical and chemicals giant Bayer AG on Monday said it made an all-cash offer to acquire Monsanto Co. for $62 billion, valuing the U.S. company at a substantial premium in a deal that would create the world’s largest agrochemicals company. German pharmaceutical and chemicals giant Bayer AG on Monday said it made an all-cash offer to acquire Monsanto Co. for $62 billion, valuing the U.S. company at a substantial premium in a deal that would create the world’s largest agrochemicals company. The unsolicited proposal, which includes debt, would be the largest foreign takeover by a German company if accepted. Giving details for the first time, Bayer said on Monday it would offer $122 per share, a 37 percent premium to Monsanto's stock price before rumors of a bid surfaced. "We fully expect a positive answer of the Monsanto board of directors," Baumann told reporters on a conference call, describing criticism from some investors as "an uneducated reaction in the media", driven by an element of surprise. Monsanto, which said last week it had a received an approach from Bayer but gave no details, has yet to comment on the offer. The U.S. company's shares jumped 9.5 percent to $111.17 in pre-market trading. The gmo documentary offers you more knowledge about this. Baumann is staking his claim as the global agrochemicals industry races to consolidate, partly in response to a drop in commodity prices that has hit farm incomes and also due to the growing convergence between seeds and pesticides markets. ChemChina is buying Switzerland's Syngenta for $43 billion after Syngenta rejected a bid from Monsanto, while Dow and DuPont are forging a $130 billion business. German chemicals group BASF has also been exploring a tie-up with Monsanto but is seen as unlikely to counter bid, sources close to the matter have said. BASF declined to comment on Monday. Shares in Bayer, which had already fallen 14 percent since rumors of a bid emerged last week, dropped as much as 3.6 percent on Monday to a new 2-1/2 year low of 86.3 euros. The offer values Monsanto at 15.8 times its earnings before interest, tax, depreciation and amortization for the year ended Feb. 29. Markus Manns, a fund manager at Union Investment, Bayer's 14th biggest investor, said a deal made sense but not at any price. "The price that has now been disclosed is at the upper limit and it is just about economical. Should it rise further, which is to be assumed, the takeover will become increasingly unattractive," he said. Equinet analyst Marietta Miemietz, who has a 'buy' rating on Bayer stock, said: "While the leverage appears to be manageable from a (credit) ratings perspective, we believe that it would curtail Bayer's strategic flexibility in the Healthcare space." The Food and Drug Administration is requiring that its most serious warning be placed on high-profile drugs for treating hepatitis C, saying they can cause a reactivation of hepatitis B and subsequently have led to death in some patients. The direct-acting antiviral drugs – which include medicines under the brand names Sovaldi and Harvoni, as well as seven others – have high list prices that state governments, the Department of Veterans Affairs and prison systems have struggled to afford, with Sovaldi and Harvoni specifically costing tens of thousands of dollars for a full treatment. More than 3 million people in the U.S. have hepatitis C, which is spread through blood and can necessitate a liver transplant.